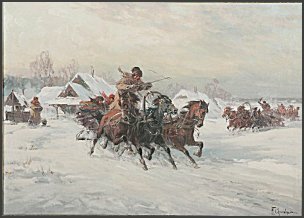 in Russia. He died in the U.S.A. in 1946. If you feel like being the fool of the year then go ahead and buy it. Contact the seller, edgeextremesports Wilkes-Barre, Pennsylvania, U.S.
but never say we didn’t warn you! The seller: "Sold for $20,000,000.00. Auction ended early with Buy It Now". 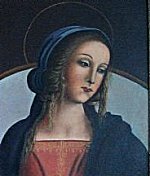 so many false paintings go through their Internet Sites, is all wrong. In time to come we expect to see less fake art at eBay and elsewhere on the Net. But for the moment our mission, to reveal fake art, is far from the goal line. are for sale at eBay. Not all of them are fakes. United States offers the same Raoul Dufy falsification. 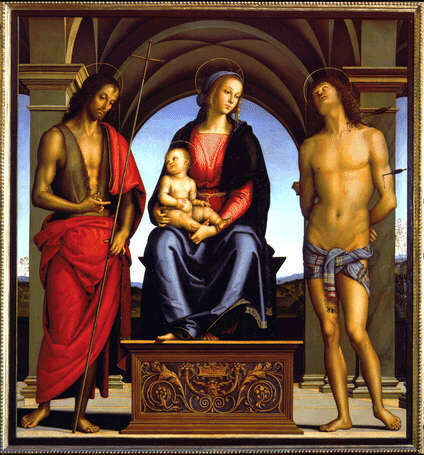 "The biggest FRAUD in the History of Art"
"WARNING! Fake art being sold on eBay and Yahoo!" 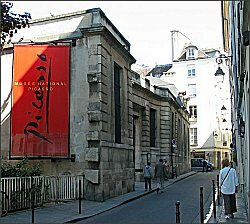 "PICASSO OR NOT PICASSO...THAT IS THE QUESTION!" CHRISTMAS & OR TAX WRITE OFF...WILL NOT LIST AGAIN!" NO! That is NOT the question! then you will never be able to see the difference between a copy (a fake) and a genuine artwork. you are an art swindler and a criminal person. 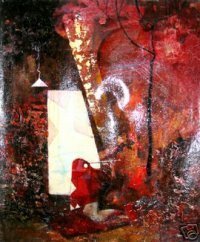 We are established UK art dealers having been in the industry for the past 10 years. and due to his advancing years has decided to dispose of some of his collection. He wants to leave something for his grandchildren. There are a lot of galleries all over the world named Ocean Gallery but no one in Kent. We, artfakes, believe that the seller is a liar and an art swindler. forgeries are produced overseas they seem to be immune from prosecution. 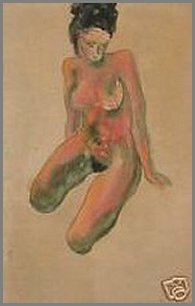 Picasso, Schiele, Gauguin and many more world-famed painters. of "gildness" here?) is in full swing selling grandpa’s false paintings. His grandfather, Joseph Goldberg, was born 1881 in Russia. He died in the U.S.A. in 1946. 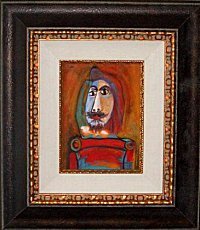 Take a look at his recent Picasso fake here! He’s here! He’s there! He’s everywhere! 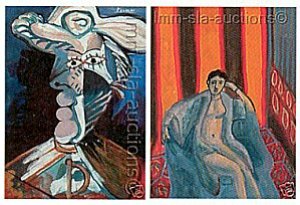 The three Picasso-signed paintings have been offered by di-laurenti-auctions September 29, 2005. 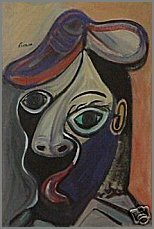 Mr. Eric I. Spoutz’s paintings declared to be forgeries! reproductions from original works by Brancusi, Warhol, Picasso and de Vlaminck. The same is true for a great number of Danish art works. 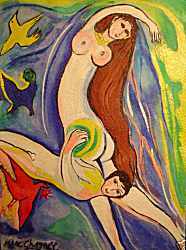 (most used), Matisse, Léger, Modigliani, Kandinsky, Chagall and many more. Mr. Eric I. Spoutz from Detroit, Mi. eBay are genuine, which you can safely bid for. Good luck! "We better call a halt now – this Picasso mess!" who want their business free of the art-faking taking place day by day at their Internet-site? We, artfakes.dk keep pushing as long as it takes. Are you the lucky buyer? 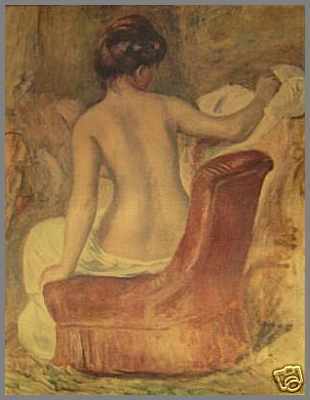 Only $400.000 for this wonderful Paul Cézanne falsification, that’s really a gift. Be happy! Buy it now! 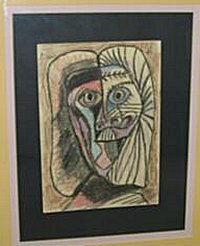 from a genuine Picasso drawing? 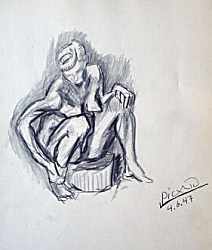 Before you buy paintings or drawings at eBay signed Picasso! photographical represents at eBay which one is the fake and which one is not. and St. Sebastian" (detail) painted by Perugino in 1493, Galleria degli Uffizi, Florence. 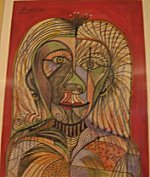 Is the above painting a genuine Picasso? 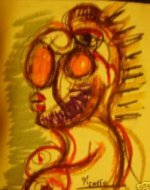 just how one can decide whether a painting,a drawing and the like is a fake or not. in exactly the same manner as by any other comparison. Take for instance those two persons below! Most people can tell the difference. They can do it because they know how the persons look like. but in the end even the most skilled art forgers are brought to light. about the most famous art forgers of today’s art history. Beware of fakes and reworked pieces. 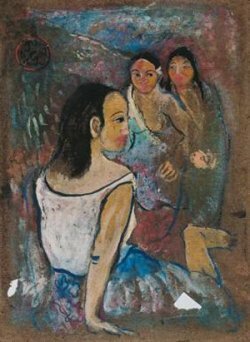 The seller: "Painting was discover in 1997 in the Moscow by S.Morozov. In 1997 and having Official Stamp for Export abroad". artfakes.dk: What does this mean? The painting has nothing to do with Picasso? 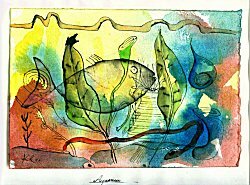 Is it an original Klee fish? "Item I last looked at"
Juan Gris didn’t care much about his own dead. Today’s greatest art swindler, Mr. Eric I. Spoutz from Detroit, Mi. 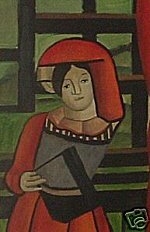 tries frankly to sell the picture shown above and ascribed to Juan Gris. Mr. Gerrit Henry and Mr. Spoutz allege that this picture is painted in 1942.
artfakes.dk, of this alone 71% from the U.S.A.
has just as good of a chance of being by the hand of the respective master". are forgeries in the sense that they do not origin from the hand of any great master. Is this painting an original Picasso? 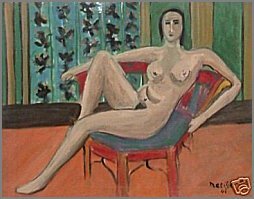 Is this painting a genuine Matisse? for a ten dollar picture? the same as saying that paintings not shown at artfakes.dk are all genuine. in our judgment, are not falsifications. like this would cost, nobody even consider selling at eBay. 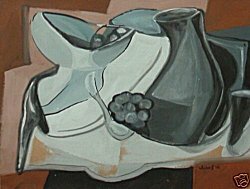 offered as a genuine work by Braque. 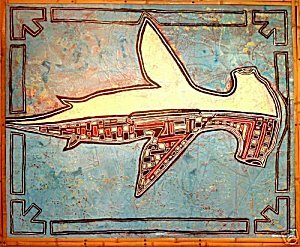 In the style of Braque – yes, perhaps! real Braque, but also it’s at least $23.000 too much for this work. 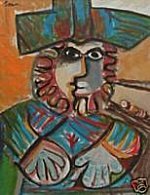 A funny painting by Picasso or is it a fake? 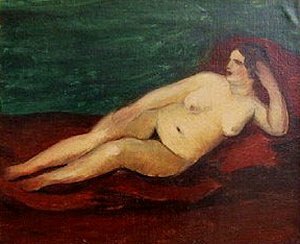 Is this picture a genuine work by the famous French fauvist, André Derain? really sold for more than £20.000/ $36.000? Who are the silly buyers? And who is the criminel seller? largest and thoroughly organized art forgery of today? qualifications. 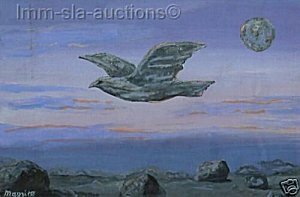 Therefore the paintings put forward for sale is to be considered falsifications. An original Picasso? No, an original fake! they belong to an organization, whose rules they violate deeply. Has Mr. Eric I. Spoutz been expelled from eBay? 5.3 Fraud. Without limiting any other remedies, eBay may suspend or terminate your account if we suspect that you (by conviction, settlement, insurance or escrow investigation, or otherwise) have engaged in fraudulent activity in connection with the Site. 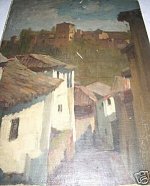 collector to sell this old oil on canvas painting. 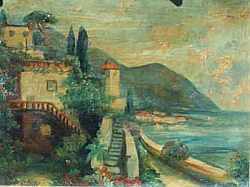 The painting is dated 8.7.38. And please send us a letter, when you find it! One of Pablo Picasso's most famous masterpieces for sale. Buy it now. Mr. Spoutz, the great art collector, is waiting for you! 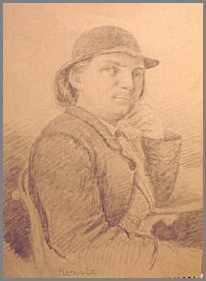 Mr. Eric I. Spoutz, Detroit, Michigan, U.S.A.
where Mr. Erik I. Spoutz from Detroit sells both falsifications and genuine works by famous artists. this practice – they care for nothing but great fees is the only impression that one can get from this. in Mr. Spoutz’s fantasy world. See for yourself. All famous artists but none for sale at eBay; it's all bubbles from Alice in Wonderland. 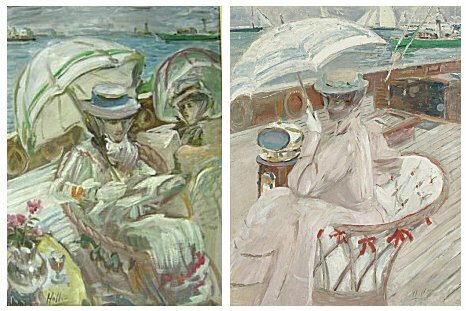 The painting shown to the left one tries to sell attributed on ebay. 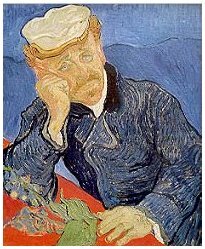 May 6, 2004, for $300.000,00 plus fee at Sotheby's. 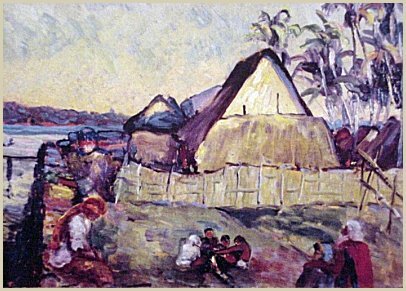 Is this an original Gauguin? arm and fingers of the woman shown to the left. which, no doubt about that, are fabulous presented at the latter’s homepage. have no doubts whatsoever:) Best Regards". Bidding has ended. No bids. that eBay allows Mr. Spoutz to put these falsifications forward for sale. 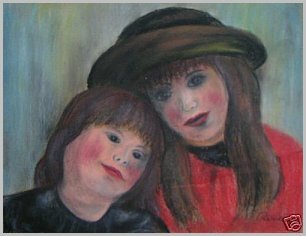 Is this wonderful painting painted by the great art seller, Mr. Eric I. Spoutz himself? And is it a self-portrait? Michigan, U.S.A. in which he now tells us that he will no longer sell his paintings as attributed. 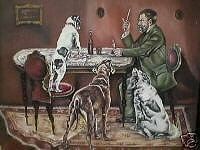 forgeries, which Mr. Spoutz are now putting forward for sale at eBay.com. What’s the logic behind this? Well, you’ll have to ask Mr. Spoutz! per the terms and conditions of the respective auction listings. the buyers attention to what he eventually is going to buy, namely a forgery. made by the famous names they carry. as was it an original Renoir. And the seller will sell it for only $150! would cost, as I will simply be acting based upon principal. The painting to the left is an original work by Egon Schiele from 1917 painted in Tempera. and the President of the Eric I. Spoutz Collection of Fine Art. 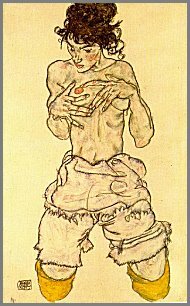 Anybody can see, that the picture to the right is NOT painted by Egon Schiele. including another one (below) by the same artist? 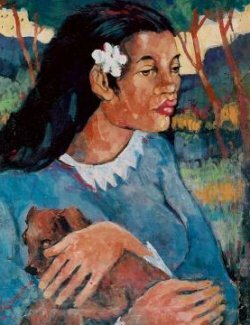 Paul Gauguin (1848-1903), but they never glanced at the artist's palette. Latest news: Warren Styles: "I am not the seller"
Who are the criminel people selling these falsifications? 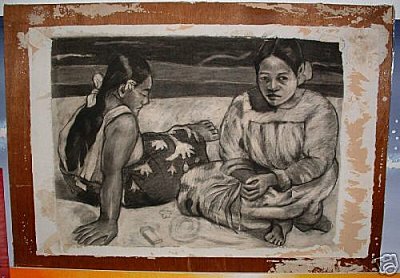 Is this picture painted by Paul Gauguin? as a direct consequence of artfakes' intervention. full of great deals, and a safe, reliable place to trade with other people. and enjoyably in the eBay marketplace".